A bundle of dried California White Sage, tied with colored string. Three to five inches long. 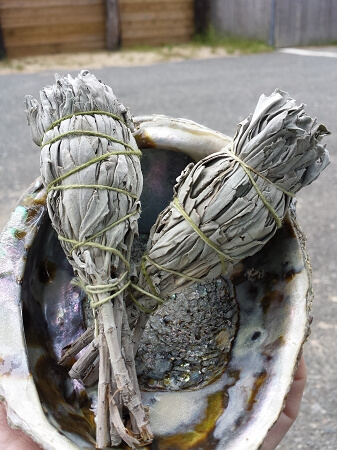 Used for fragrance and magical purposes.&nbsp;Sage smudging is traditionally used in ceremonies for purification. Also a great way to purify a room of unpleasant odors. Light one end and blow on the smudge stick to produce smoke. Often used with abalone shell or incense dish to keep embers from falling. Always thoroughly extinguish smudge stick after use.